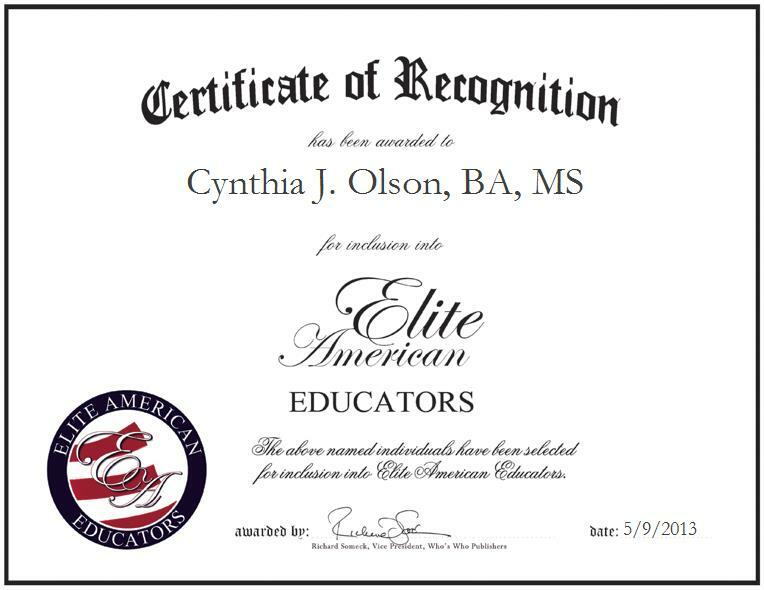 ← Julie M. Kuehl Kitchen, Ph.D.
JOLIET, IL, May 9, 2013, Cynthia J. Olson, BA, MS, Former Special Education Teacher from Laraway Community Consolidated School District 70-C, has been recognized by Elite American Educators for dedication, achievements, and leadership in special education. Prior to her retirement from her teaching role at a renowned school district in Joliet, Illinois, Ms. Olson was in charge of educating students with special needs, helping to address each individual student’s unique needs. She taught fifth- through eighth-grade students with learning disabilities and emotional disorders, taught reading skills to students of all grade levels, and worked with students with behavioral disorders. She was also in charge of teaching social and behavioral skills to help students become productive citizens. Ms. Olson is a published author. She has written “Twanna Underground,” “Cherise’s Christmas Wish,” “Elaine and Tangles” and “Kiera’s Cry.” These books can be purchased through Barnes & Noble, Amazon.com and PublishAmerica.com. Her books are geared toward young adults, and are based on her experiences as a special education teacher. She taught art classes for many years before becoming involved with special education. She is also an oil painter, and she has made porcelain dolls.